After eight years with a Republican in the White House, U.S. Senator Herb Kohl says Democratic control now means many important priorities are finally getting the attention they deserve. The Wisconsin Democrat says so many of those goals have been long delayed, and can now be met. However, he says the fight will not always be easy and the party needs to work together "arm in arm" until the very end. Kohl says health care reforms are at the top of the list, with a system that gives so little in return for what the nation spend on it. He says major reforms are needed to make sure the United States has a competitive system that guarantees coverage for all citizens. Kohl says there also needs to be a focus on rebuilding the nation for the 21st Century and building green energy sources. 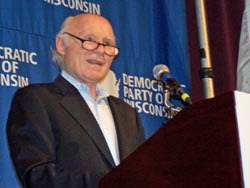 Senator Kohl addressed delegates this weekend in Green Bay, at the state Democratic Party&apos;s annual convention. He thanked them for helping to make Wisconsin a "true blue" state following the election of President Obama last November.